Here is my Ho Chi Minh running map link. 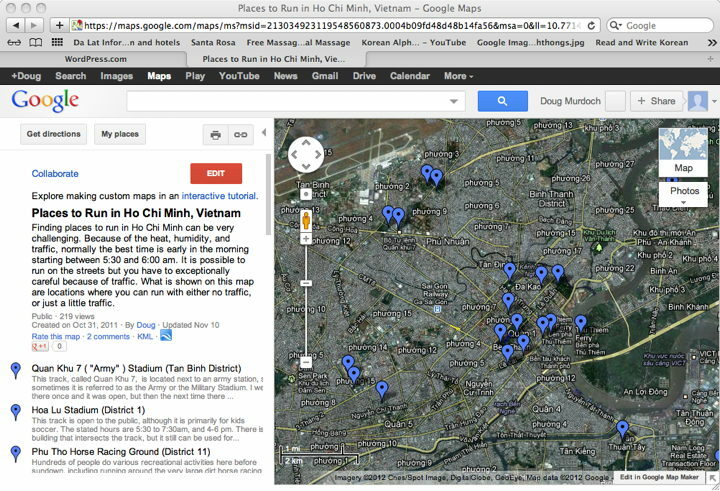 I decided to create this running map of Ho Chi Minh to help visiting runners. Ho Chi Minh can be a bit shocking for first time visitors, especially for runners, given the motorbikes, traffic, and questionable sidewalks. If you read the running forums, there are a number of negative comments about running in Ho Chi Minh, which is partially what inspired me to create this map. If you can get past the culture shock, there are quite a number of places to run in Ho Chi Minh, but you do have to be very careful. As a runner, no one will stop for you or give you the right away – this includes motorbikes, cars, and even other pedestrians. The best time to go running is in the morning, between 5:30 – 6 am, to avoid traffic and the heat. Since normal temperatures are 70 – 100 degrees F twenty four hours a day, you need to be very careful about when you run and how hard, paying very careful attention to signs of overheating. Often I carry a water bottle and an energy bar just in case, as well as some cash and my hotel business card. If you have any questions about my running map, let me know!